My love of travel by public transport doesn’t normally entitle me to travel by cable car. And until a few months ago this small adventure across the River Thames wouldn’t have been possible. The ‘Emirates Air Line’ cable car is the first urban cableway in the UK. 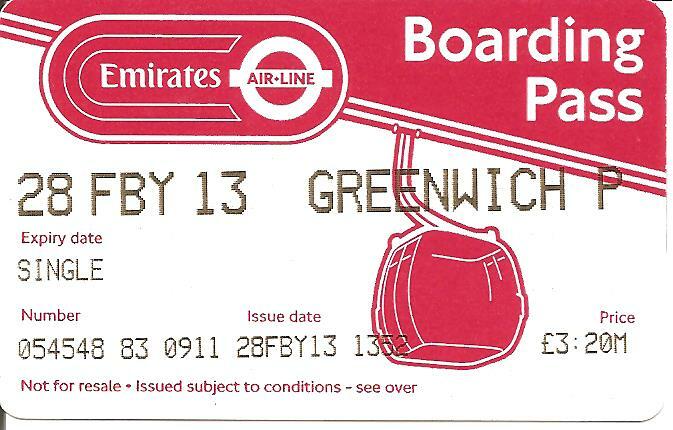 It was with some skepticism that I bought my single ticket (a 25% reduction for travelcard holders) and boarded the slow-moving cars at London’s Greenwich peninsula on the south bank close to the O2 Arena. At first glance the cable car lacks a certain elegance; the individual cars a little boxy in shape. The seating inside, enough for 10 in all, was pleasant if basic, a lot like other forms of public transport. A flat-screen television on the roof shows the exact location of the car on the route, though with the skeptic-ridding views I failed to notice it until the last minute. The car rose quickly to its maximum height of 11.84 metres quickly, doing 6 m/s all the while (that’s 14 miles an hour to normal folk). It swayed a little from side to side before settling into smooth motion. It had a real sense of momentum, ensuring a continuous change of view during the 10 minute ride: from O2 Arena and Canary Wharf to my first views of the Olympic Park. Not only that, the views of London from that height and angle must be unique. Coming close to the Royal Dock terminal on the Thames’ north bank the cars undercut the flight-path of airliners heading to the runway of London City Airport, the row of landing lights and stretch of grey tarmac now visible among the waters of the old docks. People from all over Europe were ending their journeys at the airport as I ended mine from south to north London within their view.